A recent opinion piece in Ha’aretz by Gideon Levy, the beleaguered conscience of Israeli journalism, speculated about what Prime Minister Netanyahu would have said when he addressed the UN General Assembly if he was remotely interested in peace with the Palestinians. It was headlined It’s all a daydream. In this article I’m going to share my daydream about what President Obama would say in a prime time address to his fellow Americans, after the November mid-term elections, if he wanted to earn his Nobel Peace Prize. Before he speaks he extracts some folded notes from his inside jacket pocket and waves them. My fellow Americans, tonight I’m going to tell you what I want to do on a critical matter of foreign policy in what remains of my Presidency and why it is in America’s best interests that you assist me to overcome the obstacles I will encounter in Congress. But l’ll begin by saying I am fully aware that many of you are very disappointed in me. There are three related reasons why to date my presidency has fallen short of its promise. The first is that I inherited a terrible mess on many fronts, at home and abroad. The second is that when I entered the White House I was not experienced enough to deal with the mess. I was somewhat naive and had a lot of on-the-job learning to do. The third is that American presidents are effectively the prisoners of a corrupt political system. We think we are a democracy but in one most important respect we are not. What passes for democracy in our nation is for sale to the lobbies of powerful vested interests which provide most of the campaign funding for elections to Congress and, yes, the White House. They provide the funding to guarantee that those in receipt of it will do their bidding, even when doing so is not in America’s own best interests. Tonight I am declaring my intention to try to break out of this prison, but if I am to be free to put America’s own best interests first I will need your help. I’ll get to how you can help me in a moment. There is one main reason for what is wrongly called the growth of anti-Americanism throughout the Arab and wider Muslim world. I say wrongly called because most Arabs and other Muslims do not hate American people or our way of life. As a matter of fact very many Arabs and other Muslims would come to live in America if they could in order to have a better life and prospects than they do in their own countries. What very many Arabs and other Muslims DO hate is the double standard of American foreign policy. We assert that our mission in the world is to enforce international law and that we are true and passionate supporters of political and human rights and justice for all. But so far as almost all Arabs and other Muslims are concerned the reality of some aspects of our foreign policy gives the lie – a big, fat lie – to this assertion. Tonight, and because it is an underlying cause of Arab and other Muslim hurt, humiliation and anger. I want to focus on one particular aspect of our double standard - our support for Israel right or wrong, an Israel that regards itself as being above the law as it continues its oppression of the occupied Palestinians and expands its illegal settlement activity. Under its current leadership an acceptable amount of justice for the Palestinians is not on Israel’s agenda. My fellow Americans, it is not, repeat NOT, in America’s own best interests to go on giving this Israel our unconditional support. Starting tonight I am going to take the lead in securing a binding UN Security Council Resolution that will demand, in accordance with Resolution 242 of 22 November 1967, an end to Israel’s occupation in exchange for a comprehensive peace with the entire Arab and Muslim world including Iran. The resolution will say that if Israel does not make the necessary withdrawals for peace based on two states with Jerusalem an undivided, open city and the capital of both states, it will be isolated and sanctioned, with America taking the lead in the sanctioning process. To avoid any misunderstanding I must tell you I am not suggesting that a peaceful resolution of the Israel-Palestine conflict will be some kind of magic wand. It will not solve all of our problems with the Arab and wider Muslim world, but it will make them much more manageable because, as I’ve already said, our support to date for Israel right or wrong, and all that means in terms of denying the Palestinians an acceptable amount of justice, is an underlying cause of Arab and other Muslim hurt, humiliation and anger. When by our actions we demonstrate we really mean that all nations including Israel must live and act in accordance with international law, America will again be respected by the vast majority of Arabs and other Muslims everywhere, and that in turn will make the task of isolating, containing and eventually defeating the forces of violent Islamic fundamentalism in all of its manifestations a mission possible. For those in Congress who support Israel right or wrong and who will be mobilized to do battle with me, I have a question. Are you Americans first or paid agents of a foreign power and its lobby in this country? Now, my fellow Americans, to what I am asking you to do to give me the best possible chance of preventing Congress blocking the route to peace – peace on terms that will provide the Palestinians with an acceptable amount of justice and security for all. I want you to lobby by all means those you elected to the House of Representatives and the Senate and tell them that if they continue to support Israel right or wrong you will not vote for them again. God Bless America and what we must do together to give our democracy some real substance and make it work for justice and peace. Question: In what is left of his presidency after the November mid-term elections, what are the chances that Obama will seek to mobilise popular support to secure himself the freedom to take on those in Congress who do the Zionist lobby’s bidding? In my view only time will and events give us the answer. But for the sake of discussion let us suppose that President Obama did secure the freedom to use all the leverage he has. The question arising then would be this. Would actually using it, or even a statement of real intent to use it, cause Israel to be serious about peace on terms the Palestinians and the whole Arab and wider Muslim would could accept? One is “No” because a majority of Israel’s Jews, brainwashed by Zionist propaganda, regard themselves as the victims and not the oppressors and would support a leadership that told Obama and the world to go to hell. The other possible answer is “Yes” because nothing is more important for most Israeli Jews than a good relationship with a protective America; and if a majority believed that relationship was in real danger, they would insist that their leaders changed course and headed for peace with the Palestinians. 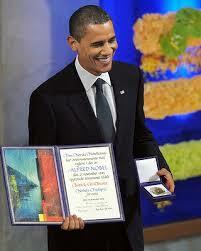 My own conclusion, which takes account of the fact that a majority of Americans have some degree of contempt for Congress, is that Obama has the chance to earn his Nobel Peace Prize if he has the will and the courage (the balls) to do what is necessary for peace based on an acceptable amount of justice for the Palestinians and security for all. If he doesn’t do it I think the countdown to catastrophe for the region and the world will be unstoppable. We can all dream, but I suspect with the mainstream media under 'their' belt, I very much doubt that Obama would risk having his skeletons in the cupboard see the daylight throughout his retirement! This American would absolutely love to see Obama act with such courage! I have already told my congress members that I will not support anyone who supports Israel. Alan: I think we all must encourage Obama to take a bold initiative in the case of I-P. To hammer his message home with the maximum chance of success, I think he should simultaneously address the brainwashed Israeli public from the Knesset, broadcast live on Israeli and American TV nationwide, prime time, Hebrew translation, announced well in time with maximum fanfare and secrecy), as I suggested in my article "The Israel-Palestine conflict, an impossible dilemma for Obama?" I disagree with Sami: at this stage of his presidency, Obama has nothing to lose, everything to gain. A talented, inspiring speaker, he must be able to press the right buttons in the attitude of the Israeli and American public to do the right thing. This could save his legacy. No.3 - Obama can only fool himself by saying that. He had been part of the "US corrupt political system" for decades before the powerful AIPAC carried him into the White House on its shoulders. In fact, Obama was so obsessed with US-Israel created ISIS monsters during his recent speech at the UNGA that he almost ignored Palestinians. The Poorly Informed Citizens of this Country Have been Led so far away from the Truths of what is Really going on...And have Come to this realization So many Times (( After The fact )) that NOW..Most of Us are Leery When Faced with a Truth...Something WE Need desperately, but now have to Double Check Three times To assure of Legitimacy ! Shameful, isn`t it ? That this Be the case,,Here in The Land of The Free..The Home of The Brave >> Now..Who is responsible for this State of Affairs ?? Our Infiltrated, Infected Congress..That is Who ! But we are now Waking up from our ""Induced Sleep ! Thank God .